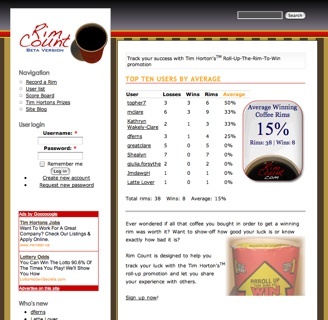 My latest web creation is a web site for fans and the curious to track their experience with the Tim Horton’s rim promotion. RimCount.com is currently in public beta, but I hope to have it fully ready for the 2008 campaign. For now, I encourage you to create an account, record your rims via the web, E-Mail or your cell phone and track your “luck” against that of your friends. If you have any suggestions for the web site please let me know! Take a stand as his co-conspirators do! Thanks to Toronto product designer Wendy Tancock for coming up with all of this. She sells this as a T-shirts, though they aren’t in retail stores or on her website (www.wendytancockdesign.com). You are currently browsing the iMatt :: The Blog of Matt Clare weblog archives for March, 2007 .